Founded in Chinese principles, Qigong is a self-healing practice of aligning movement, awareness and breathwork. Qigong has been around for thousands of years and literally translates to energy work (Qi meaning vital energy, and gong meaning work or skill). This simple, yet powerful healing modality is beneficial in moving stuck energy through meridians and extraordinary vessels. When Qi flows smoothly there is health and vitality, and when Qi is stagnant or deficient there is pain, illness and dysfunction. Although from the same origin, Qigong is often confused with tai chi, but it is different as tai chi is based in martial arts, is more complex and takes years of study to master. 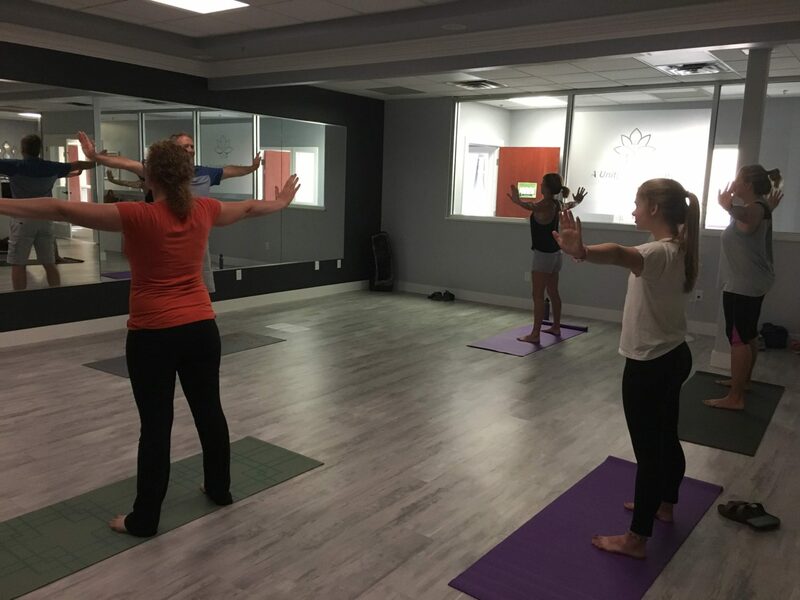 The gentle exercises are comprised of a series of movements that are repeated, while also stretching the body, increasing energy and fluid movement and ultimately building awareness. As you become more aware of the the energy in your body, it is much easier to understand the energy of your thoughts and emotions. Once this is mastered, you can then better comprehend the energy of your spirit. Meditation is an important part of the Qigong practice, as it trains the mind to direct and regulate energy flow within the body. The importance of inner tranquility cannot be overestimated! I attended one of Jeremy Kuecks’ classes at The Studio at Cutting Edge and realized very quickly I have been breathing incorrectly my whole life! As we got started, we were instructed on the proper way to breathe – when you inhale, your belly should expand (instead of a rising chest), and your belly should contract during exhale. I learned the breathing method helps restore natural digestive rhythm, increase lung capacity up to 15%, release tension throughout the body and improve the function of the heart and circulatory system. We were then led through the Heaven and Earth sequence, which is one of the oldest Qigong sets and is tied to the Wood element in Chinese medicine. It primarily works with healing and cleansing the spine, chest, liver, gallbladder and focuses on balancing the Yin (associated with Earth) and Yang (associated with heaven) energies. The primary energy principle is pulsing (opening and closing), which teaches how everything in you, your life and the universe pulses between Yin and Yang. By the end of the class, my whole face tingled as I was getting much more oxygen than I was used to. I felt relaxed, yet energized as I left the studio. But then the emotional release started to happen. I had feelings of anxiety, sadness and depression that came to the surface. I started crying for unknown reasons when I got home. Yet, I ended up going to bed early, slept like a rock, and woke up feeling well-rested, happy and tension-free! If you’re looking to release stuck emotions and unblock energy in your body, practicing Qigong is one of the most effective ways to do so. It was incredible to me how much I was able to release in one class! You can find a Qigong instructor near you HERE. Qigong is always done within your capacity and can even be done while seated in a chair. Great for all ages, the sequences are gentle enough to be used by people with chronic and more serious illnesses, as well as the elderly. In Chinese medicine, doctors will prescribe specific Qigong movements for different ailments. Melody, age 70: With getting older and surviving two form of cancer, my body and balance are not what they were. The Qigong movements are simple and could be done from a chair when I needed it. I love that it can help me build strength and give inner focus. Paul, age 73: Qigong is helping me with breath work and movement as I continue to gain strength post chemo. I am in remission after a leukemia diagnosis earlier this year and have a new lease on life. I move forward each day appreciating what it has to offer. Amy, age 48: As Jeremy was walking us through an energy awareness sequence last week, I realized the headache I had all day was gone. It is so cool to see how the body can heal itself when presented with the right tools. 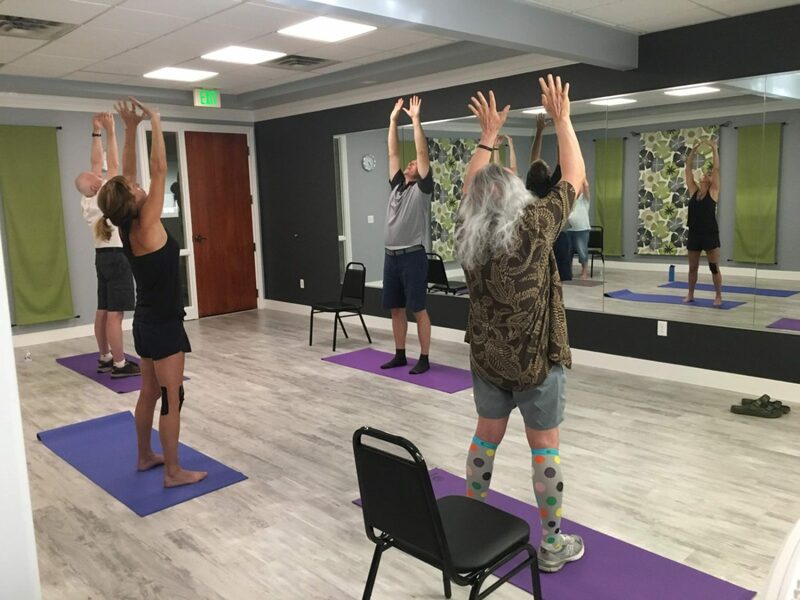 Amy, age 49: This was my first Qigong class so I didn’t know what to expect. I loved the breathing and visualization exercise and felt like I was on a whole new frequency by the time we finished. It really relaxed me and I felt like I could breathe with my whole body, which I am sure helped my central nervous system to quiet down. As we finished up, I told Jeremy that I wanted my husband and 3 daughters to come next time so that they could have this experience too! Issy, age 17: Qigong isn’t just about the energy inside you, it’s also the energy around you. Photos (including header photo above), courtesy AJ Bodywork.